A simple, affordable fitness meter that tracks your daily activity and sleep. Are you looking for an activity meter, a wristband that will give you a good overview of your fitness and the progress of your gym or sports session? Then you must consider the Fitbit Flex. 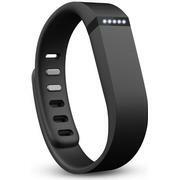 The Fitbit Flex can be used to keep track of your various daily activities and sleep patterns. This ultra-fashionable wrist band will catch the eye and become a talking point when you wear this out. Although still relatively uncommon in the UK, in the US they’ve become extremely popular with both serious fitness practitioners and part-time sports dabblers alike. When you take a closer look at the Fitbit Flex, you’ll see it’s a wrist band made from soft rubber and looks a little like a watch without a watch face. It’s surprisingly comfortable to wear while you exercise, but it’s equally unobtrusive while sitting at your desk or going out for dinner with friends. On the underside there is a small opening in which you can insert and remove a tracker as and when needed. The Fitbit Flex is waterproof, so it can withstand the rain or when training gets tough it’s equally impervious to sweat – so you never need to remove it until it needs charging. The bracelet is available in several sizes and colours, so you can customise it and get the whole family in on the action with a different colour for everyone. The activity monitor will track the number of steps you take, the distance you travel, your calories burned, the timings of your activities, and your time stationary. A futuristic LED display will show you your progress to keep you motivated, while at night it measures your sleep pattern and determines the quality of sleep, while a silent alarm will wake you up in the morning. It has a five day battery life and is easily rechargeable. Finally, the tracker can easily synchronize with a computer, tablet or smartphone using Bluetooth technology, enabling you to view and store your data for a more through analysis. Why you should buy it: If you’re after a fitness tracker that does the basics and maybe a little more, then the Fitbit Flex could be your perfect piece of kit. Since its launch there have been many advances that now show its age, but it’s eminently affordable, lightweight and looks more simplistic than totally lacking in style.